Our beautiful family chalet exudes real Alpine charm, tradition and warmth with true owner hospitality. 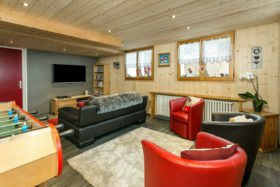 Over the last 15 years, Chalet Morzine has been lovingly renovated and extended to make the perfect winter ski holiday accommodation. 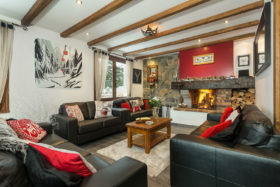 Chalet Morzine is a fantastic fusion of old and new. The lounge has a wonderful cosy atmosphere with traditional beams, an original stone surround fire place and huge conservatory bay windows at the dining end, where you can admire the stunning panoramic views over Morzine village and the slopes. Get the open log fire roaring and sink into a comfortable sofa with a wine from the honesty bar, or some afternoon tea. Surf the internet, chill out with a magazine or drum up a playlist on Spotify, Your holiday is yours. 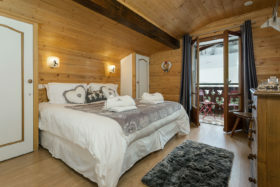 The bedrooms at Chalet Morzine are all bright, airy and spacious with balconies overlooking Morzine village or the Pleney ski slopes. We have retained original beams and recycled original wood to create an alpine yet stylish impact. Our luxury designer bathrooms all have showers and 5 out of 6 have baths, so you can have your own relaxing après ski soak. 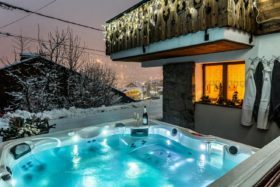 Fluffy towels, luxurious H2K bathroom products, dressing gowns and unlimited hot water all add to the luxury after a hard day’s skiing or snowboarding. This is a great space on the ground floor, away from the main lounge; popular with both adults and children alike, there is plenty to keep you occupied. A huge flat screen TV, with a Wii and Wii board, PS3, SKY television and DVD player. A collection of DVD’s, PS3 and Wii games as well as numerous handsets are there for your convenience. An excellent sized table football, a variety of board games, toddler toys and books ensures it’s a room well appreciated by everyone. Our fantastic new addition: Outdoor hot tub! It is huge for a start, seating up to 8 adults!! It has a fabulous range of massage jets to soothe away those muscles after a day on the mountain, a fountain feature, lighting options and built in speakers to connect to your ipod music. All you need then is your glass of champagne added to the wonderful alpine setting…. and you will have a job dragging yourself out for dinner!! "Thank you so much for sharing your fabulous home with us. The food and the chalet was out of this world." "Definitely the best ski chalet we have ever stayed in. Wonderful hospitality and in the nicest way, it was just like being at home."